Pokémon Go might not be marketed as a fitness game, but by building the experience around physically exploring the world, the mobile sensation is getting players up and moving. We’ve all probably seen that anecdotally over the last week, as loads of people shuffle around neighborhoods with eyes fixed to phone screens, and even Jawbone says its Up band wearers who were interested in the game are logging thousands more daily steps. If your new mission in life is to catch ‘em all, then you’re probably frantically searching for ways to find new and exciting Pokémon, perhaps consulting crowd-sourced maps to find the next Pikachu, Flareon, or Snorlax. Here’s another thought: how about a running app? RunGo—which, yes, existed before Pokémon Go (the naming is unrelated)—just debuted Pokémon-focused routes in the app, letting players sprint along paths claimed to loop through “high density” Pokémon areas and hit gyms and PokéStops in the process. And since its big standout feature is turn-by-turn voice navigation, you could potentially get in a run without needing to look at the RunGo app at all, only glancing at the screen to play. But is running really a good fit for Pokémon Go? Can you catch ‘em all without slowing down? There’s no shortage of running apps on the App Store, including some established heavyweights—but when RunGo launched in 2014, it did so with an express purpose: guiding users safely through routes without making them look at their phones. Its GPS-based voice navigation feature is much like one you’d use while driving a car, giving you an early heads-up through your headphones as you near a turn and then again once it’s time to make the move. It’s a philosophy that could apply just as well to running as playing Pokémon Go: if you aren’t paying attention to what’s in front of you, bad things can happen. Did you hear about the two guys who fell off of a cliff outside San Diego this week because they were playing Pokémon? It’s an extreme case, but you also don’t want to run into a tree branch, trip over a small child, or traipse into traffic while playing. 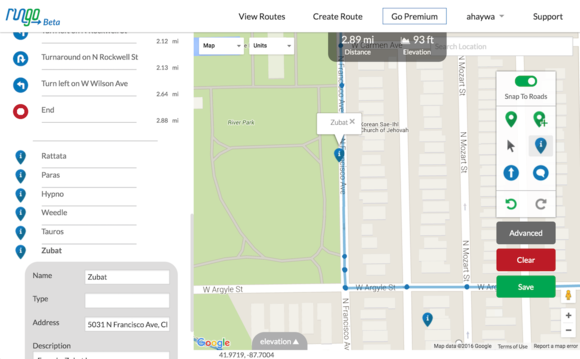 Believing their app could be used to help people safely hunt Pokémon, hit nearby gyms and PokéStops, and incubate in-game eggs, RunGo created a couple of specialized routes for players. Using those same kinds of socially-compiled maps, they designed routes in major cities that loop through areas where Pokémon have been spotted en masse. 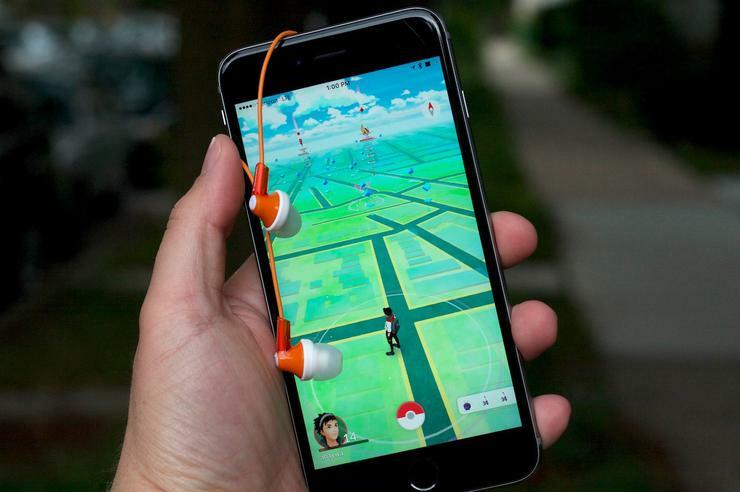 That way, runners can look away from their phone and still follow the route, but then slow down or stop when a Pokémon emerges or a PokéStop is near. Surely Central Park has a stockpile of Pokémon to capture. The New York City route is a 5-mile journey that loops you through Midtown and up into Central Park for the majority of the run, with specific mentions of Jigglypuff, Meowth, Vulpix, and other monsters along the way. And then it ends up at the PokéStop at Farmers’ Gate, where you can relax after your run by tossing down a Lure and bringing the Pokémon to you instead. Meanwhile, the Los Angeles route is a massive 18-mile trek from Santa Monica into downtown, with sightings of Psyduck and Seel along the way. It’s heavy on sightseeing and routes you into clumps of PokéStops, as well, according to Nikita Nair, communications strategist for RunGo. Given the distance and all the stops you’d make along the way, it actually sounds more like a day trip than an afternoon jaunt—you’d better pack a battery case or two for that one. Slagel says the idea came from RunGo fans themselves: “We got a bunch of requests from users, asking, ‘Hey, do you have any Pokémon Go routes?’” Thinking it’d be a fun idea, they made the first two above and have since started building a couple for San Francisco and Chicago, although those are more focused on hitting PokéStops as of this writing rather than specific Pokémon sightings themselves. While RunGo’s team might concoct a few more Pokémon-themed routes in major cities if interest is high, they hope users will go ahead and design their own via the platform’s route creator. 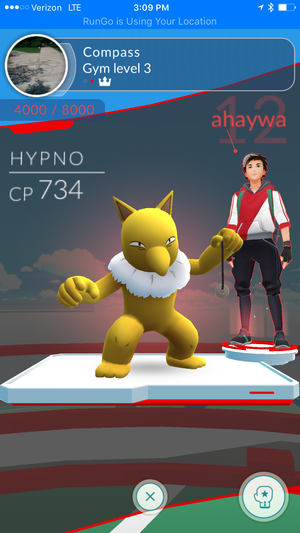 Users can drop a point of interest on the map and mention which kinds of Pokémon were spotted there, letting later runners try and fill gaps in their PokéDexes while getting a workout. If enough of a community forms around it, that could be a real resource for Pokémon Go fans. Using the web course creator, I annotated my Pokémon trek with precise locations and which monsters were found. Some, at least. I gave it a shot in my own north side Chicago neighborhood, drawing a loop of about 3 miles and then following a path that looped through a large park and near a river. RunGo doesn’t currently let you annotate routes from the app, only from the website—that feature is planned, however—so to keep notes, I’d take a screenshot of the Pokémon I captured followed by another screenshot of the RunGo app, which showed my position on the map. When I got home, I used those images to recall where I was for each capture and placed a note on the map. It’s a cumbersome process, certainly, and I missed a couple along the way because my mind was bouncing between running, catching Pokémon, and documenting the process. And if Pokémon Go’s still-wonky servers weren’t botching half of my captures at that time, I would have had way more. Still, the process worked: My route mentions several of the Pokémon found along the way, and can be searched and used by anyone on the hunt for those beasts. If I take the route again, I can go back and update it with further findings and add nuance to my Poké-path, making it a handy tool for nearby fans. However, I’m not convinced that Pokémon is the best complement for a workout. Not for me, at least. At one point, I paused the run to wander a couple blocks and take an empty spot in a gym. What, you think I’m going to pass that up? Am I really going for a run if I’m stopping every block or two to capture a Pokémon or battle a gym leader? Sure, you can fling Poké Balls while jogging, but that’s a recipe for missed shots, wasted items, and frustration. Pokémon Go gets players outside, true, but there’s a fair bit of activity involved if you’re focused on playing the game. And that constant pull between running and playing made me feel like I was half-assing both. If I’m trying to collect all the Pokémon in my path, activate PokéStops, and take over gyms, then I’ll need to stop or slow down regularly—or veer off the beaten path when I see something of interest elsewhere on the map, as I did a couple times. On the other hand, if I’m really trying to run and get a good workout, improve my times, and gain some momentum, the last thing I’d want to do is be constantly pestered to play the game. 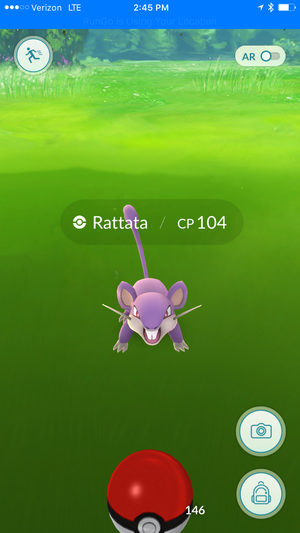 I wanted to play Pokémon Go above all, and while I had a few instances of uninterrupted running for a couple blocks or more, mostly I was focused on playing—so the experience felt a bit disjointed. On the upside, it’s more exercise than I would have gotten had I simply walked the whole way. And if you’re fine with the notion that you’re going on a guided Pokémon tour rather than a serious, focused run, these kinds of routes can help. 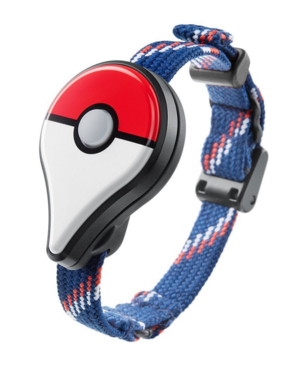 Will you pay $35 for a wearable device that only works with Pokémon Go? Quite likely, the solution to running while playing Pokémon Go isn’t to have the app open at all—it’s the Pokémon Go Plus wearable tracker that is coming out soon. The Plus vibrates and lights up when you’re near a PokéStop or a Pokémon, letting you press the button to capture it and bank the items, experience, and monsters. 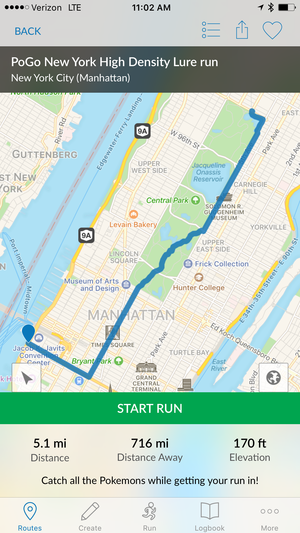 The Plus tracker sort of seems like a $35 cheat code, or the physical manifestation of an ultimate in-app purchase for this freemium experience, but it really could solve the disconnect between running and playing. That way, you still get some of the benefits of playing without actually having to stare at or interact with the app. More importantly, you can run and move unencumbered by your phone and its demands. But for the Pokémon Go player who seeks a little guidance, or the runner who doesn’t mind the demands of a game, RunGo’s routes are an intriguing start. It remains to be seen whether its community of runners embraces the notion and begins creating its own Pokémon paths through the world, but the potential is there. And Slagel has a good point about both apps not only trying to get people outside and moving, but also exploring more of the world around them.